Pebeo Pouring Medium is a transparent, glossy, fluid acrylic medium that you mix with acrylic paint to create a marble effect / cell effect. It thins the paint so that you can easily pour the acrylic and it gives a smooth shiny finish with no cracks or bubbles. 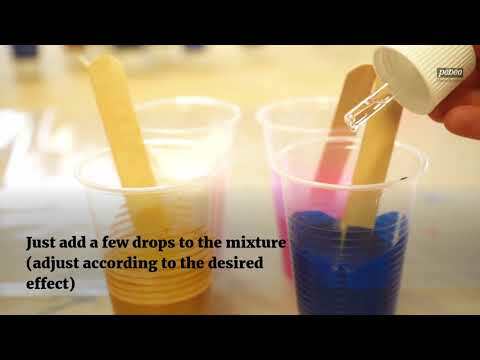 When you mix acrylic paint with pouring medium it stops the colours from all mixing together. It is perfect for creating colourful patterns, cells and marble effects on paper, wooden panels & canvas. Pebeo Studio Acrylic Pouring Medium won't change the properties of the acrylic paint or alter the colour. It is low odour and non-yellowing. How much Pouring Medium should I Mix With The Paint? The ratio of Pebeo Pouring Medium to paint depends on what Acrylic Paint you are using. If you are using Pebeo Studio Acrylics or Pebeo MAT Pub Paints, we recommend 2/3 Pebeo Pouring Medium, 1/3 Acrylic Paint & and small amount of water. You can use other brands of acrylic paint or ink (don't add water if mixing with ink or a soft body acrylic and add less pouring medium). You may need to experiment a bit to see what works best for you. Simply mix it directly with acrylic paint in a cup or container. Stir well and then pour it over your surface. You can also add several prepared colours into one cup and pour it. See the product video for more tips. Tilt your surface in different directions until it is covered. You can use objects like a cocktail stick to move the colours around. Why not try sprinkling some Pebeo Gold Leaf Flakes or Glitter in to it too?! Adding Titanium White Acrylic Paint with your Pouring Medium and other acrylic colours will also help create cells. You can also use it as a gloss varnish on your finished paintings and mixed-media pieces. To create a special cell effect (see product images), mix in Pebeo Silicon Oil with the pouring medium and acrylic colour or drop it over the top. If you gently heat it with a blow torch it will create even more cells! Pour and drip to your heart's content and get creative with Pebeo Pouring Medium!